Your special moment has past. Wedding Day Thank You Poems from the writers at My WordWizard will help you compose words of gratitude for those who helped make this such a blessed occassion. Vows have been taken, toasts read out and the festive gathering of your closest friends and family is now a warm memory. Now it's time to let them know how much you appreciate their warm wishes, generous gifts, and the support they have always given you. 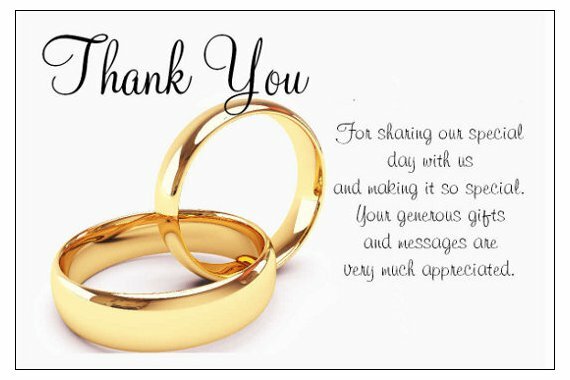 We think you'll find the perfect sentiment to help you express your thanks for their sharing in the day of your sacred union. It was great to have you there. When close friends help you share. and to have a wonderful day. Is more than we can say. Much more than we can say. and for helping to share our joy. when loved ones are around. And you helped to share our day. And you helped us on our way. knowing that you’re our friend. We hope our friendship never ends. You our happiness could share. And seeing us on our way. Helped to make our day. Are you a poet or aspiring poet? Our editors are always looking for new poems to add to our collection. Submit your Marriage Poems to our editors by clicking the "submit a poem/contact us" link at the bottom of this page.